As you are reading this update, the Junior High Quiz Bowl team will have already competed in four out of their five scheduled competitions this season. 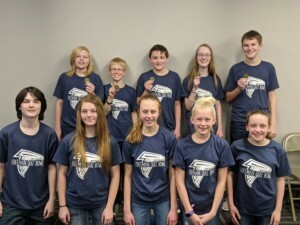 Freeman began their season with two trips to Hebron for both the Thayer Central Junior High Invitational and the ESU 5 Quiz Bowl. They also traveled to Conestoga High School to compete in the ECNC Junior High Quiz Bowl. Freeman just hosted the annual Freeman Invite on March 25th, the results of which are not yet available on this publication date. The final stop for this team will be to Southern on April 8th to represent Freeman at the annual MUDECAS Quiz Bowl. A highlight so far in the season (as of this publication date) was a first place finish at the ESU 5 Quiz Bowl. The “A” team won eight rounds in a row to earn their gold medals. Members of this team were Thies Richardson, Bryce Malchow, Rebecca Ford, Kolby Mahler, and Trevor Parde. Other members of the 2019 Junior High Quiz Bowl team include Catie Reed, Summer Buss, Grayson Gibbons, Mollie Beekman, and Kyla Davison. Keep up-to-date on the action by following Mrs. O’Connor on Twitter (@MrsOConnor27) or following #freemanfalcons.